Sour beer has two holidays in September, which is quite apt. Sour beers have been becoming increasingly popular lately, and are spreading out from the specialty beer stores and onto the grocery store shelves. 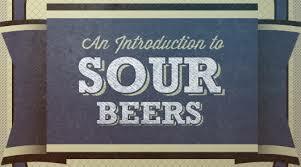 A complicated and somewhat dangerous beer to brew, sour beer is very old—dating from the time when brewers were not quite sure why what they did worked. Brewing a good beer is finicky work, in part because the most important component of beer—yeast—can be quite robust and unpredictable. There are hundreds of different kinds of yeast that will ferment sugars, but only a few of these yeast do so in a way that is palatable to us. Most brewers today strive to keep a clean, isolated brewing area in order to prevent the introduction of wild yeasts into their beers–but not all brewers. Belgium is the historical center of sour beers—as well as the source of some of the world’s best beers. (Mendo’s upcoming Anniversary Ale, though not a sour, is also a Belgian variety).